To avoid confusion and ensure a good service for our guests it is important to establish a series of terms and conditions in our service so that the client understands that he is dealing with a hotel and not with a private individual. 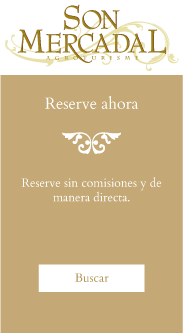 Upon receiving a reservation request, the hotel reserves the right to pre-authorize the credit card indicated on it, when making a reservation it is considered that the client has full knowledge of the reservation, payment and cancellation policies of the hotel, as well as the claims section. The credit card will only be used to guarantee the reservation for non-presentation purposes and in accordance with the clauses that continue, the client must pay directly at the establishment through the payment systems accepted by the hotel. At the time of acceptance of reservation, no charge is made on the credit card, unless the client expressly requests it and always offering the option to leave an amount to pay once the stay ends. In case of non-refundable reservations, the total amount of the reservation is debited when confirming it. No changes or cancellations are allowed and the charges made are not reimbursed. In each and every one of them appears in the way that has already been exposed. Reservations are accepted in writing by sending an e-mail to the address provided by the client, which shows the accommodation regime and total price of the contracted services, failing which it will be understood that the confirmation is accurate and will be included as an integral part of the reservation. reservation contract. Existing room availability and dates, it is a requirement to confirm the reservation paying 100% via bank transfer during the following 48 hours since the reservation was registered. Or, deliver the valid credit card information that does not expire before the Check-in date. If the reservation canceled or modified up to 10 days before the date of arrival, no fee will be charged. If you cancel or modify the reservation after the deadline will be charged 100% of the first night. If the client does not show up, the establishment will charge the entire stay. Once in the hotel and have made use of the facilities, services and housing, if the customer decides to cancel your stay, 100% of it will be charged without being entitled to reimbursement because when the booking request is made and this is already effective, the client accepts the terms and obligations of the hotel conditions. The total refund of amounts will be reimbursed by discounting transaction costs incurred by the operation, as long as a cancellation occurs within the established time. This is the information regarding cancellations in our hotel and if there is a penalty in what terms it applies, when the booking request is effective, the client accepts the terms, obligations and liability exemptions established in the conditions applied, once the Client authorizes us to make the charge on your credit card, it is because you accept the conditions established and in the terms stated. The execution of the hotel contract to which the reservation refers is carried out in accordance with the Spanish Tourism Law and other current administrative provisions. These conditions are governed by Spanish law and are subject to the provisions of this legal notice regarding interpretation, validity and execution. Pursuant to our cancellation conditions, and to guarantee compliance with the Money Laundering Prevention Law 10/210 in reserves that a payment has been made in advance and the client has not been presented, he will not have any right and nor may benefit from the refund of the amount paid, as at the time of booking have the option to pay the stay once it ends at the hotel. Note that any exchange operation is necessarily recorded on the block chain or public record so it is possible to track and analyze on the Prevention of Money Laundering source of funds. To the extent permitted by law these terms and conditions and our services shall be governed by and construed in accordance with Spanish law and any dispute arising under these terms and general or our service conditions will be presented exclusively to the competent Spanish courts. In Spain, making a fraudulent claim is illegal and punishable by law, according to the Spanish legal system, false claims can be classified as a criminal offense of fraud and punishable by a prison term of six months to three years. Claiming ailments, illnesses, discomforts, benefit from any fictitious irregularity or claim refunds, payments or discounts, actions in which there is no evidence of truth with the intention that return the money spent on vacation even though the have placidly past, may incur a false claim typified in the Spanish legal system as a criminal offense. Because the Spanish Government prevents these practices in certain countries and to curb these unjustified claims in order to obtain an economic benefit and to avoid such practices, Son Mercadal Hotel Rural informs that once the client finishes his stay and leave the hotel, Son Mercadal will not be responsible or will be responsible for any claim, if received it will be processed before the corresponding Spanish judicial system so that they determine the veracity of the claim and proceed accordingly. This information is publicly displayed on any website of each and every one of the agencies in which we collaborate and is visible to anyone.